In 1893, ten years after first moving to Giverny, Claude Monet bought a meadow next to his property on the other side of the railway. A little brook called the Ru ran through it — a diversion of the Epte, which is a tributary of the Seine. With permission from the local council he dug a pond, inspired by the water gardens depicted in his collection of Japanese woodblock prints. He bought books on botany, made designs for the layout and plants and wrote daily instructions for his seven gardeners. All this was made possible because his dealer, Paul Durand-Ruel, 80 kilometres away in Paris, had pulled him out of debt and poverty by building an international market for his paintings. 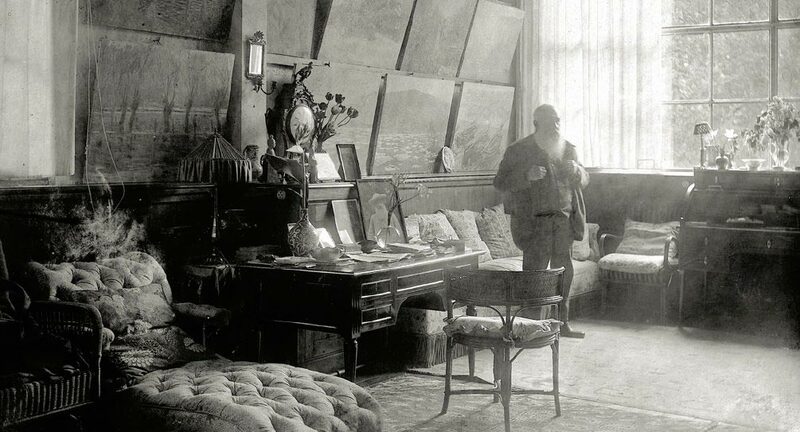 Three years earlier at age 50, Monet had saved enough money to buy the house and two acres he’d been renting from a local landowner for seven years. With his second wife, Alice Hoschedé, and her six children, along with his sons, Jean and Michel, with model Camille Doncieux, Monet built up the orchard and gardens and constructed a greenhouse and second larger sky-lit studio. When he bought the neighbouring meadow, he selected exotic water-lillies from South America and Egypt to complement the French white ones, and added weeping willows, wisterias, azaleas and bamboo. He built a Japanese-style wooden bridge and traded rare plants with his gardening friends, Prime Minister Georges Clemenceau and Impressionist Gustave Caillebotte. 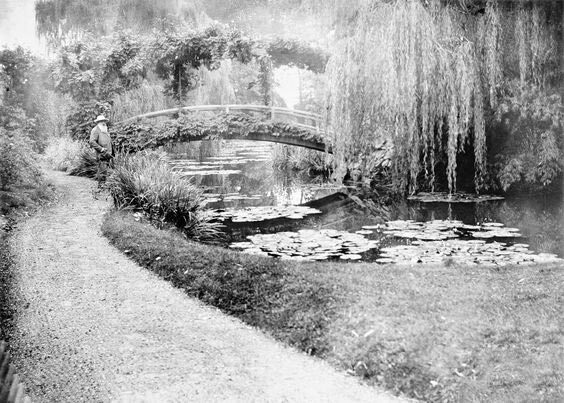 When he was 59, Monet zeroed in on painting his water garden — at first as vertical scenes with the Japanese bridge and willows. Soon, the lillies merely signalled a departure for light effects, underwater motifs, mirror-like reflections of clouds and foliage, colour vibrations and scumbled, surface abstraction, all on ever larger, panoramic canvases he lined up on easels in his purpose-built studio. 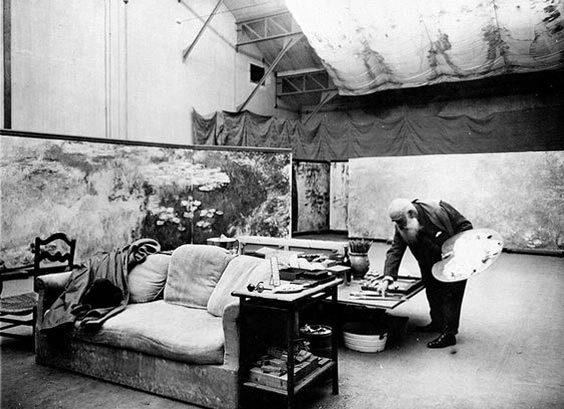 Clemenceau, who’d persuaded Monet to have an operation for his cataracts in 1923, had for years been encouraging his friend to donate his largest Nymphéas paintings to France. The specially constructed oval galleries of the Musée de l’Orangerie opened to the public in 1927, a few months after Monet’s death at age 86. Thank you so very much for these letters. I had the pleasure of visiting Giverney toward the end of October about 2 years ago. Even though it was fall the gardens were so beautiful, the autumn colours were glowing. Getting to Giverney is an easy train ride from Paris and then there are shuttle buses that meet the train. I think the gardens are closed for the later fall and winter months though so best check. While I was there, I had time to sit on a bench and do some little drawings in my travel journal, with dashes of water colour, of the house. A most timely piece, Sara! Thank you for posting! On Thursday (July 20) a friend and I went to visit “Monet’s Secret Garden” exhibition at the Vancouver Art Gallery. 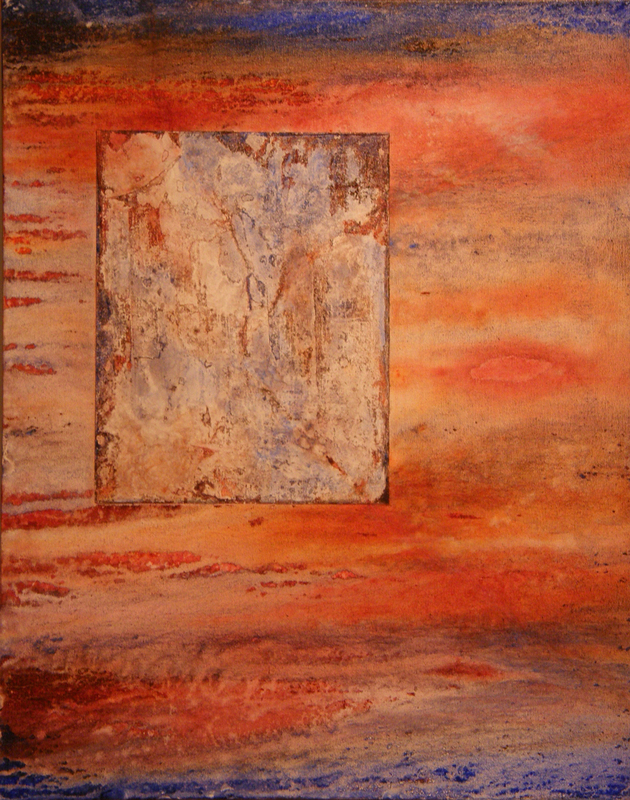 To our great disappointment, there were only a few paintings from the fabled lily pond series. 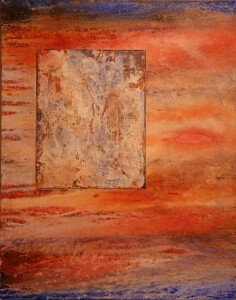 The show featured several older pieces using darker, fuller bodied colours. It made me appreciate the life-long effort it takes an artist to achieve a “signature style” and the trouble and expense that museums/galleriess have to endure to mount such exhibits. Having seen many of his paintings at the Museum of Fine Arts, Boston, and in France I have learnt to appreciate the efforts and finances it takes to mount such shows. The tour guide at the Vancouver Art Gallery mentioned that it was one of Monet’s paintings that inspired a member of the press to comment that the paintings at the Impressionists’ inaugural showing were “impressions” of landscapes and people, from which the group dubbed their name. I am almost certain I must have heard that before, but hearing it again reminded me of forgotten facts. There is nothing like the “vibration” we get from standing in front of an original piece by some long ago famous artist! This is so totally inspiring. Thank you. A timely letter as we enjoy Monet’s art this summer in Vancouver. “Claude Monet’s Secret Garden” is at the Vancouver Art Gallery until October 1st. An added treat is “Emily Carr : Into The Forest”, an exhibition of Emily’s forest paintings, which I also love. Two great reasons for repeat visits. Loved our time in Monet’s garden a few years ago. It was so perfect that I am almost afraid to go back in case the memory is tainted. We went early on a Spring day and there were no crowds then. Pure joy! Yes, it’s best to arrive as soon as possible after opening time before the coach-parties arrive. My wife and I walked from the train station at Vernon, having got an early train out from Paris to escape the cockroaches in our hotel. Yes, really! This was many years ago, mind. The walk across Paris in the dawn light was the precursor to an unforgettable day and followed on from a visit to Cezanne’s studio in Aix-en-Provence a few days earlier. Happy days! Now that’s a great post…!! we, finely attuned to find boundless beauty, for which we shiver, paint with love in our hearts. only those open to love can receive. Your father’s book is my most treasured book of art, among many. Every page demands underlining. Last year I had the great fortune of touring Monets gardens, home, and the Impressionist museum adjacent to them. 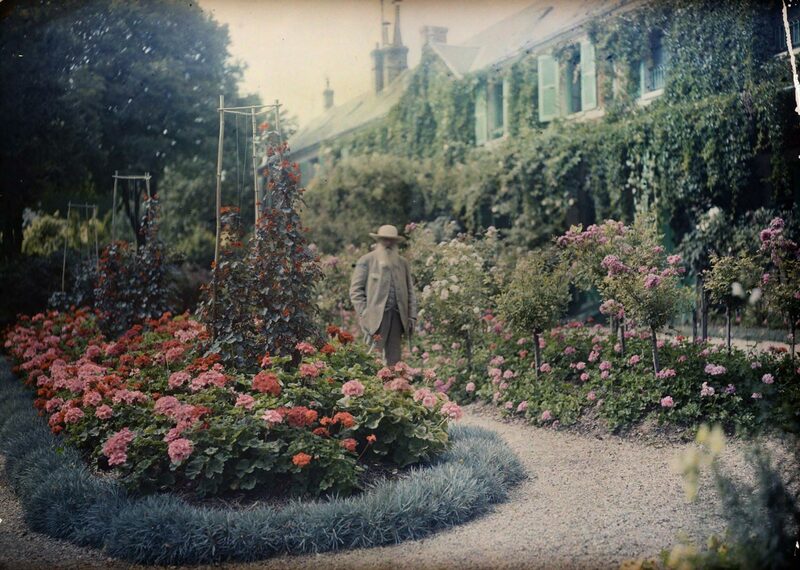 I learned a lot about Caillebotte there, and about how he and Monet traded plants. Each time I visit Paris, I always go to L’ Orangerie to see his water lillies. Thanks, Sara, for bringing my hero Monet into your letters today! What a lovely valentine to Monet, one of my all time favourite artists! Fantastic letter today, thanks! Beautiful post, Sarah. My son and I visited Giverney, April this year. The trip was a birthday gift from my son for my 75th birthday. As a retired commercial artist, this was lifelong dream to see Paris and Giverney. Then on to Madrid. Our last day was spent in Sorolla’s home and gardens. If anyone is dreaming of doing this, I highly recommend you find a way to make it happen. I can only say that both artists’ home and gardens are equivalent to a religious experience! Memories I shall treasure the rest of my life. I must say that when I came home to my own little farm and gardens I saw everything with a new appreciation of my own good fortune. It may not be Giverney, but it approximates the connection with nature, beauty and art. Feeling blessed. Critics called the Impressionist paintings messy and suggested the works were less about a creative vision than Monet’s blurred vision. As his eyes were failing, critics sneered at Monet’s color palette and his argument that his depiction of flora, water, and light was an artistic choice, spurring an initial disdain of Monet’s now-revered series. Sometimes the painter’s passion turned violent. In 1908, Monet destroyed 15 of his Water Lilies right before they were to be exhibited at the Durand-Ruel gallery in Paris. Apparently, the artist was so unhappy with the paintings that he decided to ruin them rather than have the work go on public display. He told everyone, “I’m good for nothing except painting and gardening.” It seems that I too have fallen into this path. I have gardened and painted years of my life away. An oil painting of waterlilies recently finished brought me many thoughts of this artist, who like a grandfather shared his spirit of encouragement as I spent the many hours painting. Recently added to my website as well as many other paintings of the gardens and a life created. Monet is an inspiration for my successes and my struggles, because he too walked by this way. He shared with me what tending a garden can do. It helps us to survive. To have a positive obsession and be able to afford it is success and a blessing. Not many artist get it all…..
An amazing story today! Very warm and revealing intimate little tidbits from Monet’s life. Loved it!! !